Super Mario Maker 2 looks amazing and I’m excited to play the new game. For those, who like me, are excited popular YouTuber and Mario expert Ceave Gaming has figured out how to recreate some of the new features seen in Super Mario Maker 2 in the original game. Ceave Gaming has done some amazing things in Mario games and wanted to see if he could recreate some of the new Super Mario Maker 2 features, like slopes, in the WiiU original. 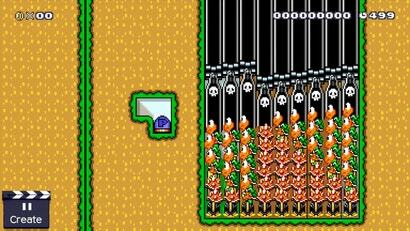 To recreate slopes, for example, in the original Mario Maker, Ceave used a series of enemies stacked on top of one and other to create a gradual incline. Then on top of them, he placed Bullet Bill launchers, creating a solid slope. This trick takes advantage of the fact that Koopas and Spinys are different sizes. It’s simple and surprisingly effective. Auto-scrolling levels required a more complex recreation. These weren’t part of the original game and to get them to work, Ceave used Bullet Bill launchers that were placed on top of shells. These shells then hit springs, music blocks and other Mario Maker parts to change their speed and direction. Add some saw blades and you have a challenging auto-scrolling level inside of the original Super Mario Maker. The entire video is a wonderful exploration of what is truly possible if you push the tools and features of the original game to their limit. Sure, in Super Mario Maker 2 these new features will most likely be easier to implement and work more how players remember them from the older games. But if you can’t wait for the sequel, you could always try making your own Super Mario Maker 2 while you wait. I skipped over the original game, but I found it incredibly impressive just how creative the community around it was (and still is). I'm super looking forward to Mario Maker 2.